The Harvest: This year we had low rain falls getting very healthy bunches. Besides, cool nights and not very hot days at the end of the cycle were excellent for a complete ripening of the grapes, full of nuances. Ageing: It takes place in the same barrels for 18 months racking every 6 months. Nose: Very expressive, elegant and complex with ripe fruit, mineral notes, sweet spices, chocolate aromas and intense toasts. Taste: Powerful, tasty, round and very smooth. We find again black berries, mineral notes, chocolates with roasted aromas. Very long after taste. 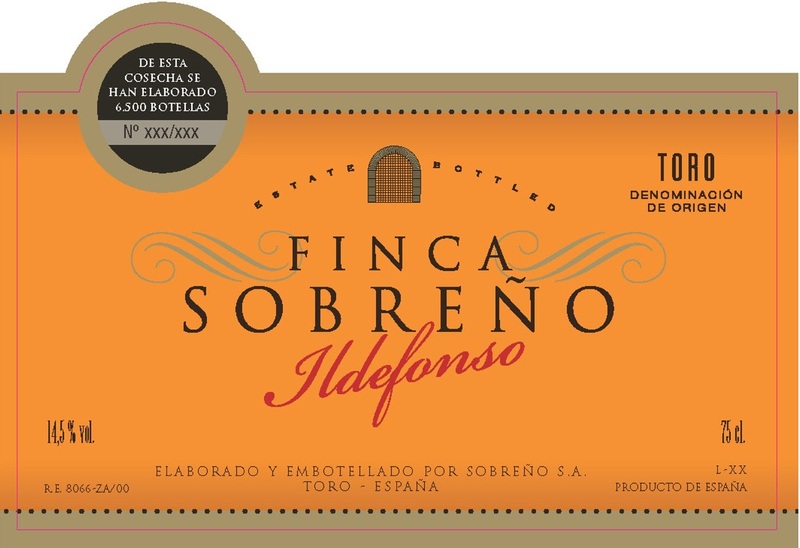 "The 2009 Finca Sobreno Ildefonso is pure Tinto de Toro, a blend from two parcels of 80-year-old vines. It sees 18 months in new French oak. It has a gorgeous, marmalade-scented bouquet with hints of blueberry and black olive tapenade that are very well-defined. The palate is full-bodied with ripe, supple tannins and layers of spicy red fruit interwoven with marmalade, clove, white pepper and bay. It is very well-balanced, powerful but not over-powering, and should age well over the next decade. Drink 2014-2025." "(made from vines that are over 80 years old; aged in all new French oak for 18 months): Inky purple. An intensely perfumed bouquet evokes candied dark berries, woodsmoke, incense and violet pastille. Stains the palate with concentrated, almost shockingly vivacious black and blue fruit flavors. Smooth, sweet and expansive on the clinging, energetic finish. - JR"
In the early 90's, a group of Rioja winemakers became interested in Toro, convinced that top class wines could be made from the local Tempranillo clone known as Tinta de Toro. The combination of Rioja know-how, modern technology, strict attention to detail and fine old-vines plantings has led Bodegas Sobreño to almost instant success in Spain and on the international scene. Bodegas Sobreño was founded in 1998. Just 7 years later, Bodegas Sobreño has become one of the best-known wineries in the region. The winery owns 1,400 barriques (primarily American oak) and boasts a production capacity of 500,000 bottles/year. The principal winemaking consultant is Manuel Ruiz Hernández, one of Rioja's most respected enologists. "One of best new estates in Toro; reds show intense fruit." Finca Sobreño currently owns 80 hectares (197 acres) of vineyard, of which about half are vines over 30 years old and divided in many small parcels. In addition, the winery controls 155 hectares of independently owned old-vines plots. The vineyards are 100% Tinta de Toro, pruned "en vaso" (bush vines), as well as double cordon Royat in the newer plantings. Soil types are alluvial with a thick clay subsoil, and a mix of sand and gravel. Yields are quite low, averaging about 4,000 kg/hectare. Roland Champion Champagne Blanc de Blancs NV is aged for minimum 30 months (the minimum for NV is 15 months). This cuvee is made from 100% Chardonnay and is produced from the free run juice only. The current release is the result of the blend of the 2005, the 2006 and the 2007 vintage. Fresh and delicate, its fine bubbles and wide range of aromas will be perfect as an aperitif. This Champagne will also match very well with seafood and shellfish. "Golden yellow color. Lively, fruity, toasty leesy aromas of honeyed brioche and apple tart with a satiny, tangy, dry-yet-fruity medium body and a sleek, interesting, snappy lemon curd, nougat, and chalk finish with silky, soft, fruit tannins. A classic example of blanc de blanc champagne, delicious." "Spiced with ground anise and ginger accents, this offers notes of poached pear, lemon meringue pie, hazelnut and stony mineral. Very elegant and well-meshed throughout, with a silky finish. Tasted twice, with consistent notes. 1,500 cases made. –AN"
"This cuvée made from 100% Chardonnay offers a fresh aromatic nose of light toast, dried yellow fruit and nuances of yeast. On the palate it has a creamy mouth feel of toasted nuts and rich autolytic notes. This is a beautiful wine, rich and complex." "Medium gold color with very attractive aromas of yeast and lemon tart. A lovely and very flavorful palate of yeast and nuts gives way to a long, long finish. This is a crowd pleaser!" "Graphite, bread dough and citrus aromas segue to lemon, apple and floral notes as this remains focused and crisp. There's a nice chalky feel on the long finish. 1,800 cases made. –BS"
"Small grower. Autumn fruits dominate the aromas of this wine, which is blatantly more like a wine than we normally expect a champagne to be. Some may find that unexpected and even off-putting, while others will find it intriguingly delicious." "Roland Champion is a small family-owned producer, now with the fourth generation, in the village of Chouilly (”shoo-ee”), which has only Grand Cru vineyards. Made from 100 percent chardonnay grapes, this Champagne offers ethereal grace and poise and harmony; if I were fighting a duel tonight, I would ask for this Champagne as my last beverage. The nose here is about the richness of warm biscuits and hazelnuts, dried fruit and spice, like a Platonic, ineffably light fruitcake; in the mouth, however, it’s about a structure that encompasses an incredible marriage of power and elegance, like the delicacy and strength of the finest bone china. And there’s something porcelain-like about this Champagne, in its notable crisp, lively character, its transparency and its slightly chalky, shale-like mineral elements. Forget the Champagnes that come on with heavy toasty, caramel qualities; here, instead, is a wealth of subtlety and nuance touched with a racy, dynamic edge. Exceptional." Roland Champion Champagne Brut Rose Grand Cru NV is the blend of 20% Chardonnay, 40% Pinot Meunier, 40% Pinot Noir. 70% of this clear juice being from the 2007 vintage, and the other 30% being from the 2006 vintage. The color is obtained by adding 15% of red wine from Verneuil, aged at least 4 years, which gives this unique orange/salmon color. Small red fruits (strawberry, raspberry, cherry), characteristic of Pinot Noir with some brioche, toasted aromas coming from the Pinot Meunier. Clear and vinous. Development of red fruit aromas (blackcurrant) on a spice backdrop (cinnamon) and a nice fresh cut apple, grapefruit flavor. A fresh, lively and delicate flavor. Ideal balance between Chardonnay, Pinot Meunier and Pinot Noir. "A delicate, subtle Champagne, delivering aromatic notes of mulling spices and yeast that accent the flavors of kirsch, bread dough, candied lemon zest and rose petal. This is finely tuned, with lively acidity and a minerally finish. 330 cases made. –AN"
"Bright orange. Aromas of blood orange, dried rose, allspice and minerals, with a subtle note of anise. Juicy and precise, with very good depth to its spicy red berry and citrus pith flavors. Finishes smooth and long, with excellent clarity and lingering spiciness." "This rosé exhibits a lovely salmon color with layered flavors of dried red fruit, grilled nuts, and yeast notes. A blend of 40% Pinot Noir, 40% Pinot Meunier, and 20% Chardonnay from two vintages, it is rich and creamy on the palate, with layers of yeast and dried red berry fruit flavors and a long refined finish." "Champion is a small grower in Chouilly, in the Cotes des Blancs, an area known for fantastic chardonnay. This rosé — of which he makes only about 330 cases — includes 10 percent red wines (pinot noir, pinot meunier) to give it a pale, salmonlike color and a beguiling palate of cranberries, strawberries and currants. Wow. And yum." Romariz Latina Tawny Reserve is a carefully selected blend of seven to nine year old Tawny Ports are used for "Reserva Latina". The port was created for the Tawny loving Brazilian markets, Reserve of the Latin hence the name "Reserva Latina". This tawny port makes an ideal after dinner offering and a lovely companion to coffee and sweets. Nutty, raisin character, great length and finesse.